TuSimple said it raised $95 million in its Series D round of funding, bringing its total funding to $178 million. The company also claimed a valuation of $1 billion — a milestone often referred to as “unicorn” status in startup parlance. TuSimple, dually headquartered in Beijing and San Diego, currently operates a test fleet of self-driving trucks that conducts daily freight runs in Arizona and will soon expand into Texas, the company said. Ike, meanwhile, announced $52 million in Series A funding from Bain Capital Ventures, Redpoint Ventures, Fontinalis Partners, Basis Set Ventures and Neo. The San Francisco-based company, which emerged from stealth mode in October, was founded by former leaders of the self-driving truck program at Uber’s Advanced Technologies Group. Uber halted its development work on automated trucks in mid-2018, choosing instead to focus its efforts on passenger cars. Other firms testing or developing automated driving technology for commercial trucks include Embark, Starsky Robotics, Waymo, PlusAI and Pronto. TuSumple’s Series D round, completed in December, was led by Sina Corp., the developer of Chinese social media platform Weibo. Composite Capital, a Hong Kong-based investment firm, also participated. TuSimple said it will use the new funds to prepare its self-driving system for commercialization. “Autonomous driving is one of the most complex AI systems humans have ever built. After three years of intense focus to reach our technical goals, we have moved beyond research into the serious work of building a commercial solution,” Xiaodi Hou, TuSimple’s founder, president and chief technology officer, said in a statement. To accelerate the introduction of its technology, TuSimple plans to expand its test fleet to more than 50 trucks by June. Those trucks will be a mix of Peterbilt and International models, all equipped with Cummins engines and outfitted with TuSimple’s self-driving system. TuSimple has announced a formal partnership with Cummins and said it is also working with other suppliers to integrate its self-driving technology with key vehicle systems such as braking and steering. Unlike some other automated truck firms, TuSimple is working to fully automate not only highway driving, but the entire route from depot to depot, including entrance and exit ramps, surface streets, intersections and loading docks. “It’s that level of completion that we feel is required to really make this a viable commercial solution,” said Chuck Price, TuSimple’s vice president of product. Today, all of TuSimple’s test trucks continue to have a backup driver behind the wheel, but the company aims to reach the point where it can remove the driver altogether — a goal the company believes could be possible within the next few years. “We need to build a huge number of validation miles to do that,” Price said. Ultimately, any effort to introduce highly automated trucks will hinge on factors such as government regulation and public acceptance of the technology. In Price’s view, any apprehension about the potential loss of drivers’ jobs is unfounded. 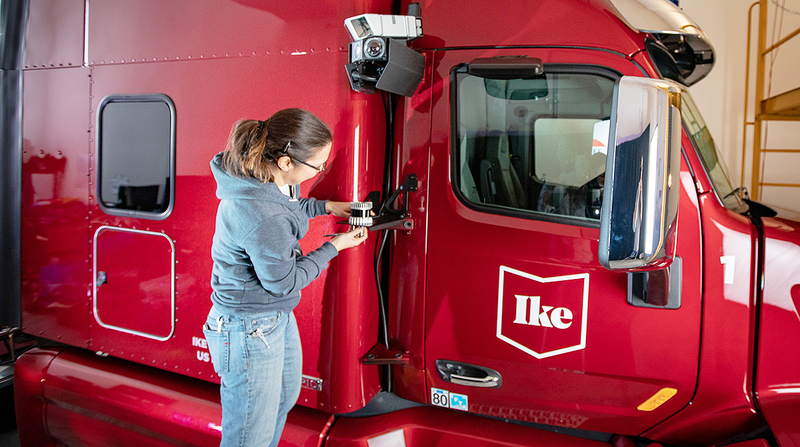 Price said autonomous trucks could introduce a range of new jobs, such as remotely monitoring the vehicles as they roll down the highway, as well as handling refueling, inspections and other situations that may require human interaction. Automation also could give rise to new kinds of high-tech maintenance jobs, he added. “There are interesting jobs that will be created for people who are truck drivers today,” Price said. Ike also said it doesn’t see its technology replacing drivers. In a blog post announcing its Series A funding, the company described commercial trucks as “the secret backbone of our economy,” and argued that self-driving technology can help address industry challenges such as the driver shortage, new regulations, safety and the growth of e-commerce. Ike also said it has spent “a lot of time” with industry stakeholders including truckers, manufacturers, suppliers, fleets, shippers, highway patrol officers and labor experts.